New Class. 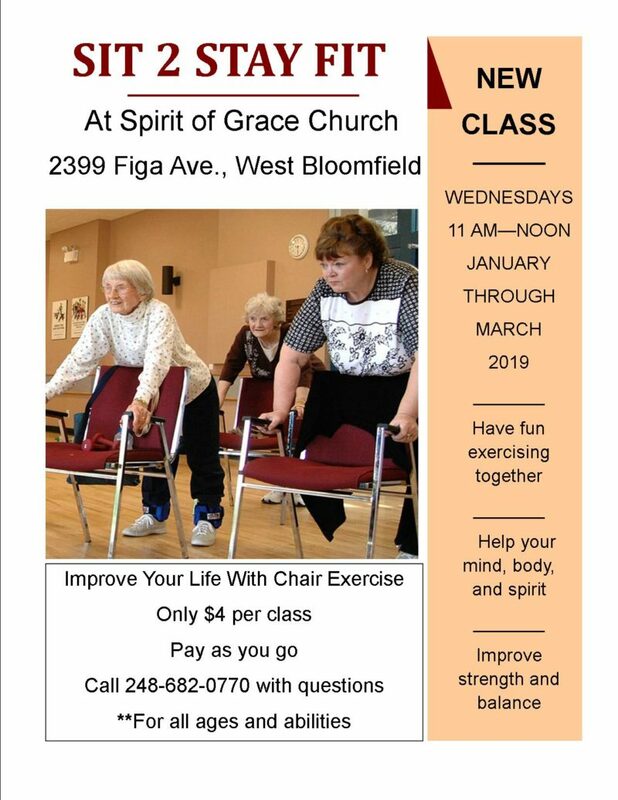 Sit 2 Stay Fit Exercise at Spirit of Grace Church, 2399 Figa, West Bloomfield. Wednesdays, 11am to noon, January through March 2019. Improve your life with chair exercise. Have fun exercising together. Help your mind, body and spirit. Improve strength and balance. Only $4 per class. Pay as you go. Drop ins welcome. For all ages and abilities. Call the church office at 248-682-0770 for information. It's family fun at the library! Watch your community on a new episode of The Splash. Join GWBHS and WB Parks for a trip to Northville to The Lace Museum and historic Mill Race Village. Family fun at the library! 6PM at West Bloomfield Town Hall. LIVE on Civic Center TV. Click for more information. Operation Medicine Cabinet allows you to dispose of your expired and/or unused prescriptions anonymously. Anyone learning English or who wants to become more proficient is invited to improve their skills during an English language discussion group. Kick start your child's learning. 7:30p at Sylvan Lake Community Center. Live on Civic Center TV. Click for more information. Learn more about the communities we serve.